Glow Puzzle is a simple puzzle app where you connect all the dots on the screen with a continuous path without reusing any paths you already made. The game is available for the iPhone, iPod touch, and iPad, and is released by Nexx Studio for Free with 20 levels. You can then expand the game by purchasing $0.99 Level packs that unlock 75 levels each. The glowing is misleading. I was expecting everything to be neon colored glow fests. Instead, I got a really good, classic pen-paper game… this seems familiar… I suppose it just reminds me of the concept of “Field Fencer” where you take an ancient game and advance it further by improving graphics and putting it on your iPhone. The gameplay is all the same. You connect dots and try to connect every open line between the dots to move on to the next level. It’s extremely simple but as the levels progress, you hit some harder puzzles that require some cleaver path finding and planning two steps ahead. The sound is relatively forgettable, so there isn’t much to note, but the graphics are bright and work well to the dark metal grate background. Let’s say that you are like me. After 20 to 30 attempts at solving a particularly complicated puzzle, you get frustrated and want to just move past it. Wish granted for us!! In the menu screen in game, you get a Solution button. When pressed, they play a video animation that will solve the puzzle. Since many of these puzzles can be solved in multiple ways, the solution can be taken as a suggestion. There are a couple puzzles that are just way too easy to solve but as you start entering the level packs, the variety really opens up and those few not-so-cleaver puzzle get lost in the field of really hard ones. The level packs are worth the dollar each, so pick this game up as a demo, and then if you like it, download the full packs. Buying the packs won’t take you out of the app itself, so it’s far more convenient then exiting the app and entering the AppStore. 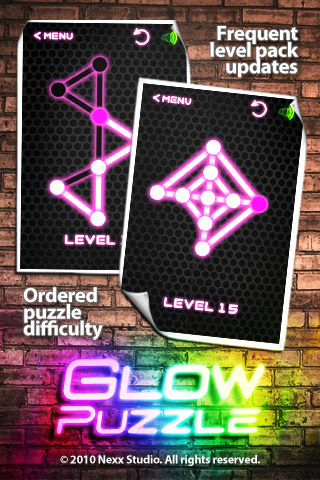 Overall, Glow Puzzle is simple to play and it would be even more fun to play with colorful puzzles. Maybe the lines could have the same neon coloring as the title and icon text. I liked it and will continue solving the puzzles. 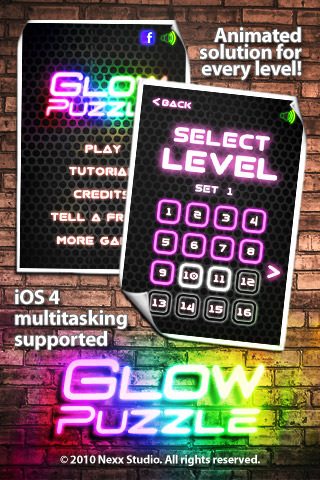 AppSafari review of Glow Puzzle was written by Joseph Ho on September 7th, 2010 and categorized under App Store, Featured, Games, Puzzler. Page viewed 6080 times, 1 so far today. Need help on using these apps? Please read the Help Page.